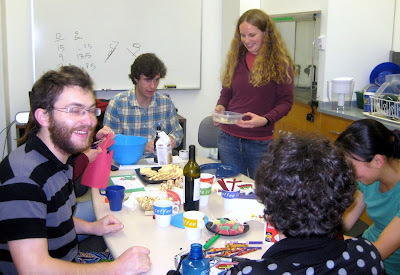 One of the great th ings about working in the lab, besides being surrounded by interesting research in the mountains, was that Dan frequently had potlucks for the marmoteers. A joke between myself (Kathleen) and another marmoteer quickly escalated into reality when I created a marmot cake for a potluck. With the help of my friend Annie, who was an amazing cook in the dining hall, I created a cake that was shaped like a marmot. I’ll be the first to admit that it looked more like a cross between a pig and a bear than a marmot but everyone in the lab enjoyed our creation. I returned my second summer with a super secret mission, that didn’t involve science but rather baking. I wanted to perfect the marmot cake and I knew exactly what it should be, a rear looking marmot (s tanding on its hind legs). As I began carving it in the dining hall I ran into my artistic friend Dewey, who helped bring the cake to life. Thus the marmot cake tradition was born. 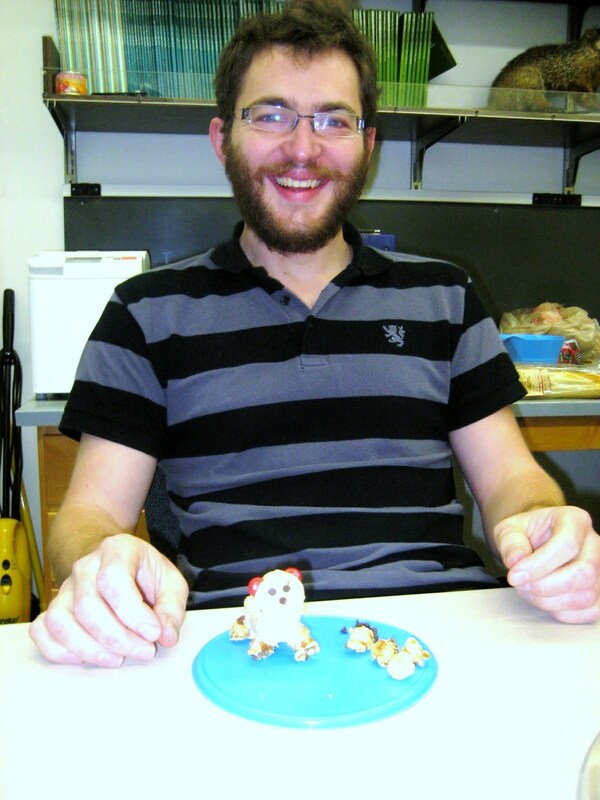 If only Dan knew what was in store for him and the marmoteers when he chose me, an avid creative baker, as his REU student! I first arrived at RMBL as Dan’s REU avian research student. That summer my project focused on estimating the American Robin’s large song repertoire through a comparison of techniques. Although my project involved birds, when the marmoteers needed an extra hand, I volunteered. That fall I continued to work on my project as in independent study at Michigan State University. The following spring I was excited to accept Dan’s invitation to join the marmoteer team. I was able to enjoy a wonderful marmoteering experience in addition to beautiful hikes and the amazing scenery. I spent the majority of this summer trapping pups throughout the valley and observing the town marmots that live in Gothic, while fine-tuning my soon-to-be published paper from the previous summer. 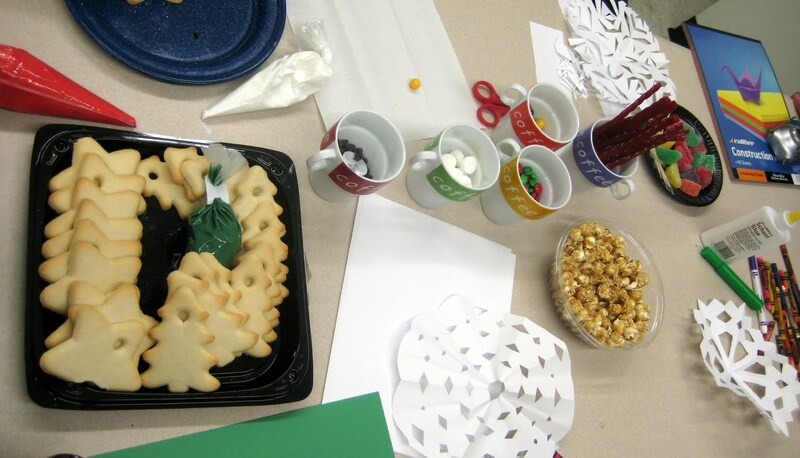 This holiday season, Team Marmot gathered round at UCLA to make some holiday treats! I was in the middle of cutting snowflakes out of paper when inspiration hit. 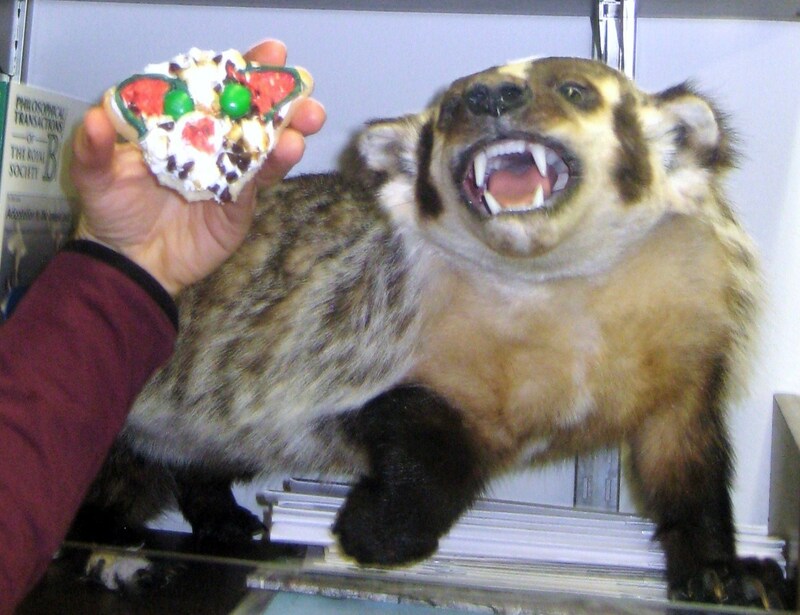 Let's make cookies in the shape of marmots. My co-workers were quick to point out the fact that my creation looked a bit more like the face of a badger or even an owl than that of marmot, but you be the judge! Social facilitation is a strong force in the natural word, and one innovation can often invite others to join in on the fun. Within moments, Julian was on his way to creating a marmot out of a tower of Rice Krispies treats and caramel popcorn. Finally, a true work of art indeed! 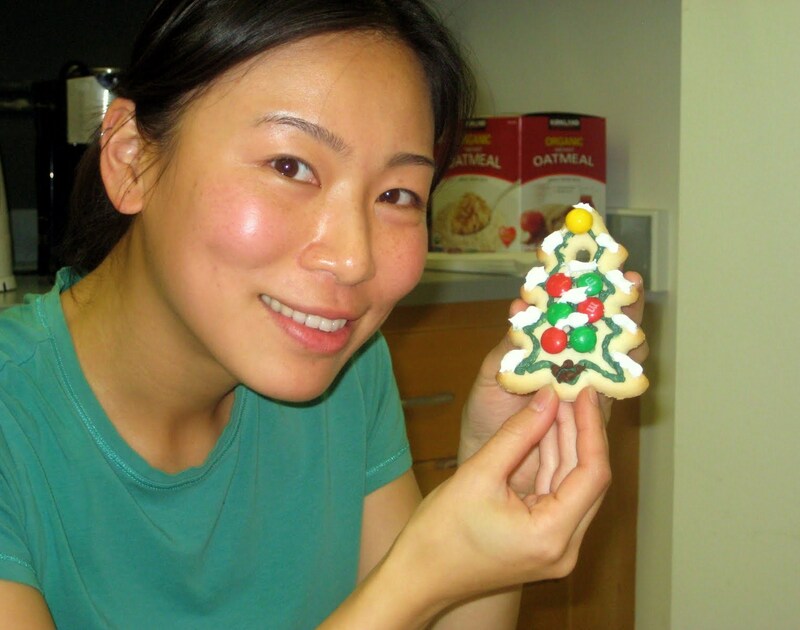 Still others, like Tina and Nicole, went on to create traditional works of beauty out of the tree shaped cookies. I, of course, decided to carry-on and turned my Christmas Tree cookie into a sleeping marmot splayed out on a warm summer afternoon (or a road kill marmot depending on your vantage point)! Happy Holidays from Team Marmot! During summer, the scientists of RMBL live among wild animals of many shapes and sizes. Marmoteers tend to live among marmots more than other ecologists do, and almost everyone live with one type of rodent or another. Cabins in Gothic are pretty good about keeping out the medium-sized creatures like deer and foxes. But occasionally, rodents like baby porcupines and big marmots beat the maintenance team to the entrance. Mama marmot Anchor making an unannounced visit to Richards through the cabin floor. Picture by Ben Blonder. There’s also the deer mice, the most common rodent of them all. These mice thrive throughout most of North America. Even at 9500ft in the middle of the Rockies, they are a force to be reckoned with. 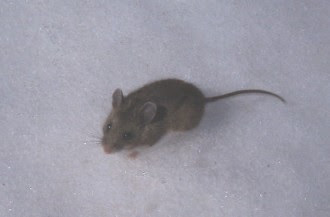 Adult deer mice weigh approximately 15 grams. Picture from RMBL website. 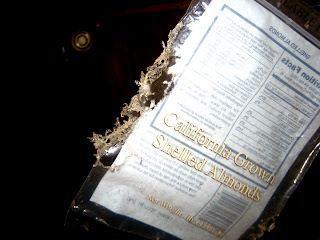 A bag without its almond contents (one pound's worth), chewed through and emptied overnight within closed drawers. At 15 grams per individual, my 454-gram almond deficit probably fed families. Somewhere in the walls of Forest Queen during those summer nights, they feasted. 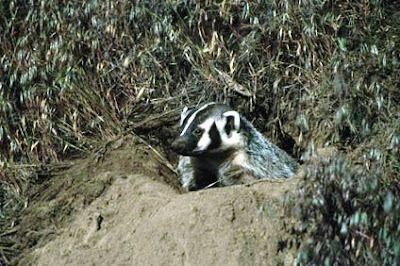 Underground Cafe: Are the Badgers Back? This news is just in from our field correspondent, Billy Barr. Billy lives at RMBL year round and keeps the fieldsite up and running regardless of how much snow and ice the weather brings! 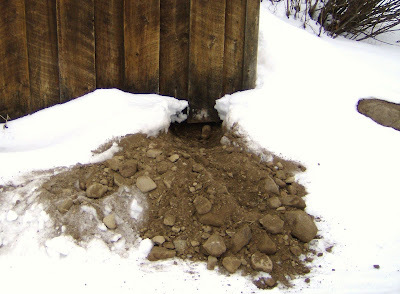 Billy writes, "I came to the office this morning and saw this- quite a substantial digging of the marmot hole next to Johnson Lab. I doubt it got any marmot but there was quite the big pile of debris from the hole the fox dug. If we still had badgers here anymore, then I would think the marmot would be in trouble, but not from a fox as I assume they are unable to dig holes that are deep enough." The hole looks pretty deep indeed. Could a fox have done this? Could it be that badgers are in fact be back in town? The jury is still out and we need your help, so please post a comment. Read more about these carnivores on-line at the University of Michigan's Animal Diversity Website. 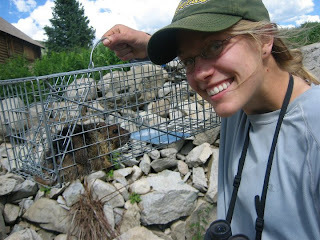 Marmots (and Researchers) in the News! Several members of the marmot team were featured today on the web...congratulations to Dan, Tina, Julien, and I (Amanda) for our publication on "Heritable victimization and the benefits of agonistic relationships"! The article was officially released today, and was accompanied by some news coverage. These short, snappy pieces provide a nice overview of the paper, as well as comments from other scientists in the field. 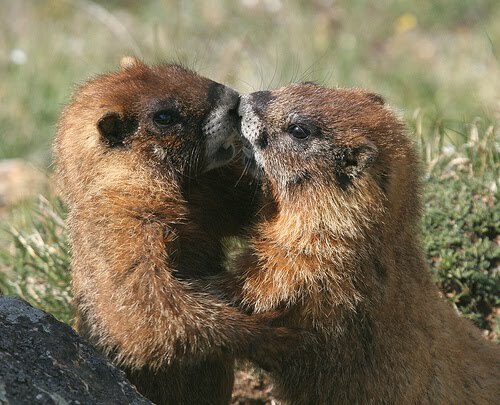 Check out the links below (as well as my blog entry "Popularity contests") for some fun discussions of marmot relationships. "Wow, some researcher really wants to blame his parents for a sad high school experience. People probably made fun of you because you followed small rodents around writing about their social lives instead of focusing on your own." My name is Allie Anderson, and I am the most recent Research Experience for Undergraduates (REU) student to work with the Marmot Crew. While most of the Marmoteers are based at UCLA, I hail from the University of Wisconsin-Stevens Point where I am a 4th year undergraduate student studying biology. This summer I was fortunate to be placed with Team Marmot through RMBL’s REU program that is funded by the National Science Foundation. I spent the summer collecting data for the lab as well as conducting my own research project investigating the effects of burrow distance on anti-predator vigilance behaviors in marmots. My project looks at how marmots respond to the risk of being eaten as they travel farther from the safety of their burrow to forage. Marmots must eat and get fat in order to survive the winter hibernation, but eating requires marmots to leave their burrows, increasing the risk that they will become a predator’s tasty snack. I predicted that marmots would increase their vigilance behaviors as they moved farther from the burrow, but interestingly, I did not find this to be the case. There was only a significant change in marmot foraging behavior when other marmots were in the area. Look for more updates as I continue working on my paper this winter. Marmot pics courtesy of Yvonne Chi. I really am inspired to share my excitement of field research with others. Each year we have 8-12 people (mostly volunteers) working on Team Marmot. And, each year we have to train these folks to properly collect data. It takes a while, but once trained, students learn that they can help collect high-quality data that can help us explain the diversity of life. Training involves going out with folks and watching marmots. Marmot watching isn't quite like you may have been led to believe by watching National Geographic nature shows (OK, I'm dating myself--I should have said Discovery Channel nature shows). There's a lot of sitting and waiting. Waiting for the marmots to emerge from their burrows. We do this because we want to know where they're sleeping and with whom--it's a bit of a soap opera out there. Waiting for them to engage in social behaviors. Social interactions allow us to understand how embedded into their group they are--a factor that turns out to have major consequences for dispersal. Waiting for predators to walk, run, or fly by so that we can see the marmots' responses. We have to teach people to read the marks. Using fur dye we paint numbers, signs, symbols, and letters on the marmots' backs. With these, we can identify animals from afar. Reading marks is sometimes a challenge. A's look like deltas or P's depending upon the angle you're looking at the marmot from. We wait and wait for them to turn, and then blink and boom--they're gone. Positive identifying the individuals we collect data on, however, is essential. Learning to wait, watch, listen, and perceive what's going on around us is a good skill. And our field sites are in very pretty locations, which makes the wait all the more worth it. Hi, my name is Yvonne, and I am a graduating senior majoring in Biology and Political Science. I am also a huge marmot fan! Yvonne holding the marmot pup Square-Line-Square at Gray's Cabin in South Gothic, Colorado. In March 2010, when Dan recruited me to join the ranks of the marmoteers at RMBL, I only had a vague idea of what marmots are… something along the lines of giant hibernating rodents who eat a lot. As I found out, some marmots are giant indeed! 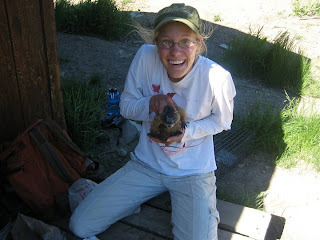 Over the course of the summer, I engaged in my share of wrestling matches with 5-kilogram adult male marmots who were less than thrilled about being “bagged and tagged” and would writhe and scuffle and chomp down at any human body part within range of their formidable buck teeth. I also observed medium-sized marmots (yearlings), watching them through my binoculars or spotting scope and recording their play as they chased each other across the spectacularly scenic river valley landscape. There were also tiny marmots, fuzzy pups that warmed hands and hearts on the wet, chilly mornings of the mountains. Newly emerged pups weighed less than 500 grams; they could be cupped in one hand and were exceedingly photogenic! The marmot pup Six Dice Dots after being tagged at River Cliff. Forget cats and dogs; I’m a marmot person. I plan to work with the Blumstein Lab during my next two quarters on an honors thesis about marmot alarm calls. I am extremely excited to be, once again, in the company of those who gave me an incredible summer filled with epic adventures, breathtaking beauty, and the most awesome animals! I visited the RMBL field site for the first time this summer and was taking a look around late one morning after we had finished our marmot research. During my walk, I encountered a fox very intently focused on something. In fact, that fox was sitting on the porch of one of the cabins that the researchers stay in! A closer look revealed to me that this clever fox was watching one of our marmots! He was sitting very quietly just like a dog on his best behavior waiting for a treat. However, this member of the family Canidae was waiting to snack on a marmot. Panning out on the image below, you can see that this fox had learned the location of this marmot's burrow and was waiting patiently for the marmot to come out. However, marmots are excellent at detecting predators and this marmot, just like me, had seen the fox. 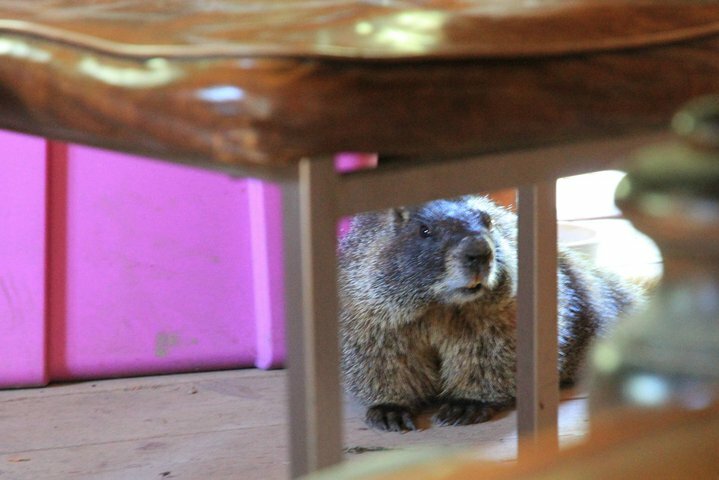 The marmot responded by quickly seeking cover and lived to see yet another day at RMBL. Predators and their prey are constantly evolving new ways to "outwit" each other. This leads to what us biologists call an "evolutionary arms-race." In this race, at least on this day, the marmot has won. Perhaps we should change the phrase, "clever as a fox" to "clever as a marmot"! Meet Team Marmot's Jeffrey Sanker: The countdown is over! 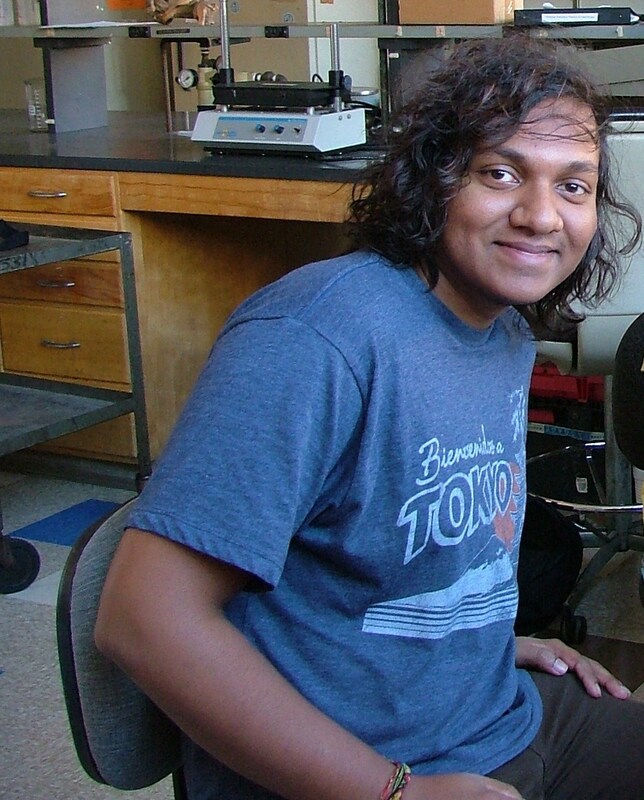 Hello, my name is Jeffrey Sanker and I am a second year, undergraduate Biology major at UCLA. I’ve recently started working in the Blumstein lab at the beginning of the Fall 2010 quarter. While in the lab, I look at blood slides taken from a number of marmots in order to preform cell counts. I tally the number of lymphocytes, neutrophils, monocytes, eosinophils, basophils, and trypanosomes observed in each blood slide. Each slide examined is a small adventure. I never know what to expect when looking at each one under a microscope. There are times when the layer of cells are so thick that it is difficult to distinguish between certain types of cells. There are other times when identifying cells can be tedious due to the number of lymphocytes and neutrophils on a given slide being very scarce. It is nearing the end of the Fall 2010 quarter and I am glad to announce that all two-hundred and fifty blood slides have been surveyed and their respective cell types accounted for. Currently, I am entering data recorded from each slide into the computer. My hands-on work in the lab with Team Marmot has been an incredible experience and I look forward to coming to the Blumstein lab every day.